That the early-21st-century global power shift is underway is becoming increasingly obvious year on year. And it can be found reflected across the architectural canvas. The past 10 years have seen a very visible changing of the architectural guard - it is no longer a transatlantic conversation. Every month new, young practices pop up around the planet, which have nothing to do with either Old World Europe or New World North America. 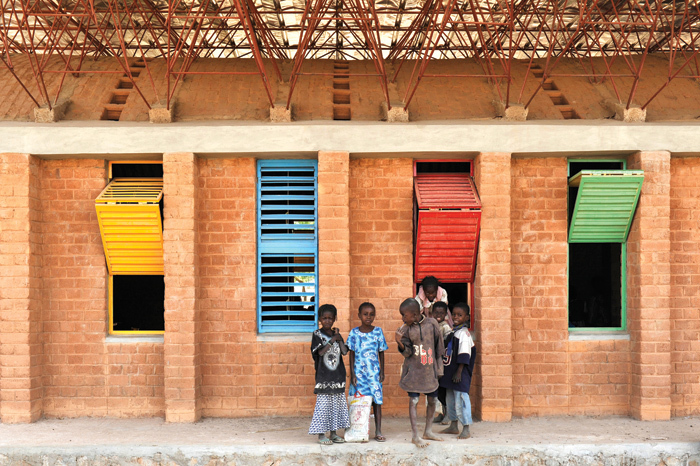 Of all the architects’ stories in this new shift, none is more remarkable than that of Francis Kéré, who hails from the West African country of Burkina Faso. Kéré’s story is unique, though considerably better known across the Continent than in Britain, having been based in Berlin since the late Nineties. That may be about to change — this year Kéré is the first African to design the Serpentine Galleries’ Summer Pavilion in London’s Kensington Gardens (23 June–8 October). The son of the chief of the small Burkinabe village Gando, Kéré was the first child in the village to learn to read, having been sent away to school where classes were held in searing 40 degree-plus temperatures. His time at the school also involved helping repair structures, setting the young boy thinking about how to improve and cool these pressure-cooker buildings. He went on to receive a carpentry scholarship in Germany. Once in Berlin the young African put himself through evening classes so he could apply — successfully — for a place at Berlin’s Technical University architecture school. Soon after starting the course Kéré founded a charity to fund a primary school in Gando, which was built with the whole village community in 2001. The project won him the Aga Khan Award for Architecture in 2004. It was the first in a line of projects that embody his building philosophy, combining traditional materials and techniques with modern engineering methods. ‘I believe it is important to engage people in the process of building so they have an investment in what is developed,’ he said in his keynote speech at this year’s AIA Conference on Architecture. 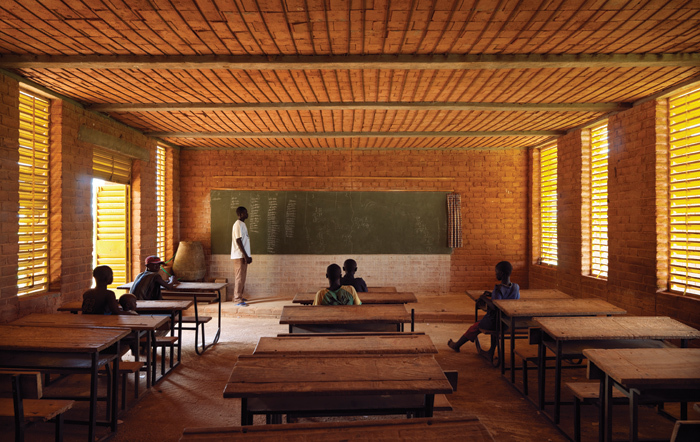 Since then, Kéré has become well known across continental Europe for an ever-expanding number of schools in Burkina Faso, including an expansion to Gando school in 2008, as well as the Opera Village project in Laongo created in collaboration with the late German performance artist Christoph Schlingensief. This ongoing project was first intended to provide a performance centre to celebrate African film and theatre, but following major flood damage to the site evolved into a broader project with classrooms, housing, media labs, workshops and a medical centre (completed in 2014) for the local community. Other projects have been in neighbouring Mali, such as a series of buildings for the National Park of Mali, built in 2010 to coincide with the 50th anniversary of the independence of the country, and the Centre de l’Architecture en Terre for the Aga Khan Trust for Culture (AKTC) in Mopti (also 2010). In 2014, after his countrymen and women rebelled against the then president Blaise Compaoré in his attempts to extend his 27 years of rule, the parliament in the capital, Ouagadougou, was burned down. Last year Kéré — maybe not unexpectedly — was announced as the architect for the new parliament building, Assemblée Nationale. It’s an extraordinary and inspiring tale, which continues to unfold. Kéré was part of the Royal Academy’s Sensing Spaces 2014 group exhibition, but the Serpentine’s solo showcase is sure to bring massive attention to the architect and his socially engaged architecture. Some in the architectural bubble have been critical of the Serpentine’s choice, feeling the low-tech pavilion is disappointing after the era of Arup-engineered tradition of ‘wow’ structural experiments. For Kéré and his office, however, it’s a fantastic opportunity to tap into the engineer’s — Aecom these days rather than Arup — experience and expertise and help the studio’s knowledge base. 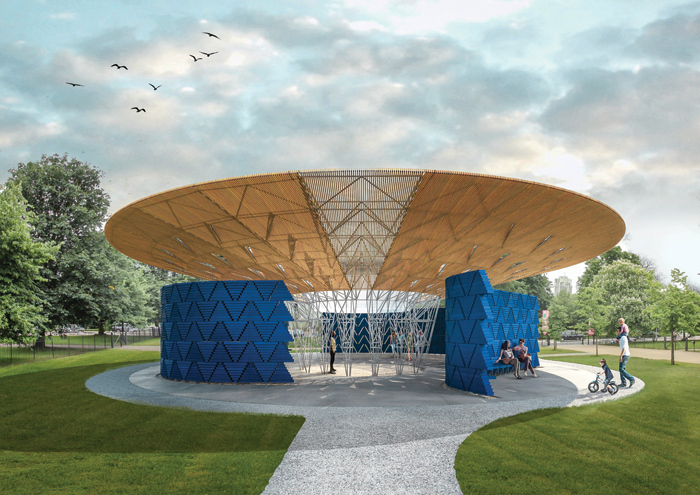 The pavilion also symbolically represents a sheltering tree, with its wide, overhanging roof discus and super lightweight steel support structure, bringing echoes of the Sahel’s heat and dust to Hyde Park in high summer. The pavilion continues a theme of Kéré’s, which he already used in his installation at the Louisiana Museum of Modern Art’s AFRICA exhibition in Denmark (2015) — the tree’s ur symbolism across the African continent as a protective gathering place against the unforgiving heat of the sun. In the Serpentine Pavilion, water is funnelled into the heart of the structure, a further symbolic reference to his home country as a part of the continent that continues to have its share of devastating droughts. As Kéré’s office states, this is ‘water as a fundamental resource for human survival and prosperity’. Kéré’s inaugural British building project is long overdue. How long will the wait be for a full-scale project on these shores?